Marjie has been creating and blogging for quite a few years and as a blogger myself it's been fabulous watching her art and designs change and see her become so active and create a business for herself in this challenging world we live in. 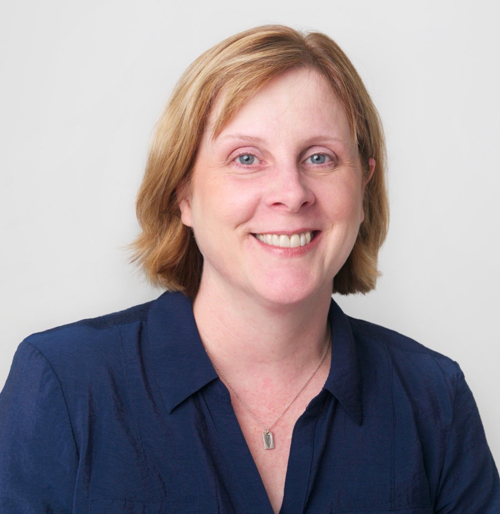 She teaches across America and has an online workshop too, she has been published in many publications and has become very well known in the industry. Over to Marjie to introduce herself and share her project for today. Hi, everyone. Marjie Kemper, here. 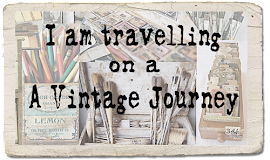 It's a pleasure to be your guest today at A Vintage Journey! I adore mixed media art and am honored to be with you. My passions are art making, teaching classes, and running my own small business, and I'm currently working on new online courses that will address all of these topics. 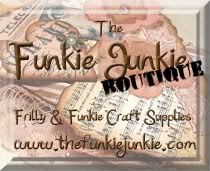 You can find me on my website and any of the social platforms. When I heard Jennie's theme was "Crazy for Autumn Colors," I knew I'd be reaching immediately for my Distress Oxide inks. Our fall is coming late this year in New York, so I've created my own burst of fall color with this project. I've used a combination of materials on this one. 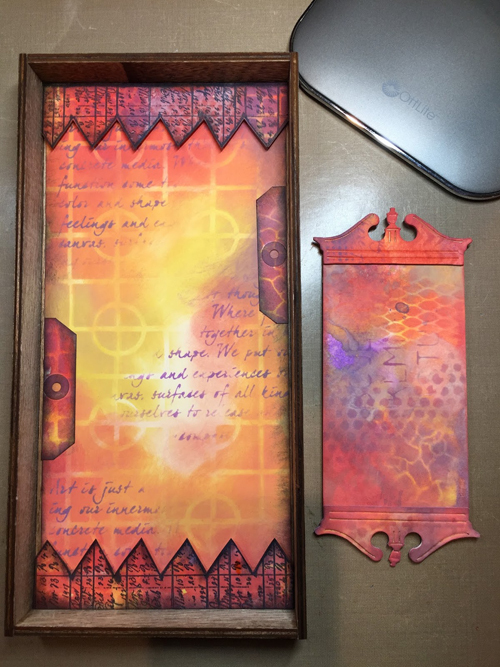 The base is one of Tim Holtz's shadow boxes. 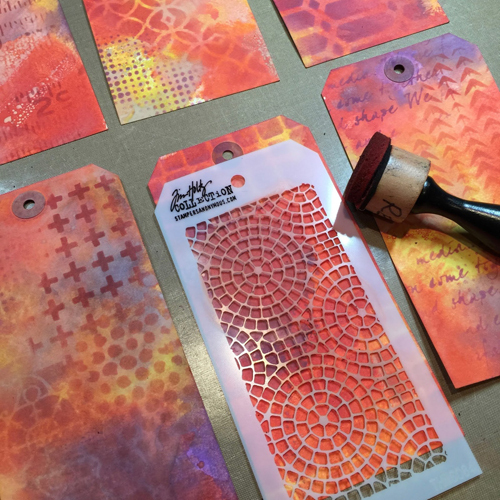 After inking up all the tags with a variety of Distress Oxide inks, I added interest with stencils and an ink blending tool. Once all the tags were dry, I cut up some of the them, diecut others, and stamped on a few as well. I used the same inking and stenciling on a larger piece of manila card for the base, and I tried to keep this in a light/bright color pattern. I used several pieces of cardboard to support my tag, so it appears to be 3-D in the box. The top and bottom accents on this tag are from a Pediments Sizzix die. I've used metal accents and chit chat stickers to jazz it up. I've created a Distress Ink Blending Checklist that I'd love to share with you. 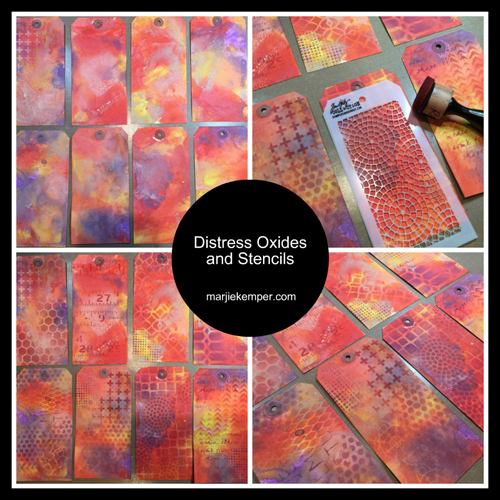 As you know, Distress Oxides are unique in that they are a combination of dye and pigment inks. This checklist is a basic guideline on color blending, which I do the same way with both Distress Oxides and regular Distress Inks. Pop on over to my blog for a copy if you'd find that useful. Oh Yes it's a wonderful day spending some time looking at these gorgeous tags Marjie and how you have cut them and designed this beautiful box. The autumnal hues fit the challenge brief perfectly and what a glorious mix of rich and golden tones you have produced. Thank you so much for making the time to share your incredible talent with us here at A Vintage Journey and making such a superb project. 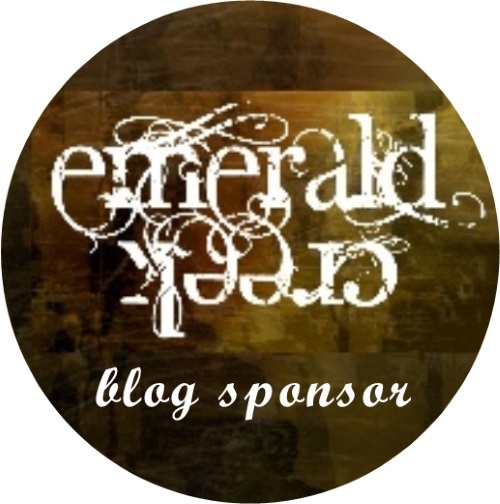 I hope you, our lovely readers, will take a moment to pop over to Marjie's blog and see both this and all her other work, I shall also be looking for the Blending Checklist, I find little aide memoirs and checklist tools such great things to keep to look at time and again when I'm working with those particular products. The 'Crazy for Autumn Colours' is still running for another week and it's such a pleasure to see and get to visit so many brilliant entries already linked up, I hope you can join in if you haven't already. Enjoy these autumn days while we have them here in the northern hemisphere, it seems the season has started a little late but the colours are now looking stunning. Enjoy the weekend and any creative time you have planned. Thanks so much, Anne! It was a delight to be back with all of you here at AVJ. Thanks, Jennie! I do love using up those tags. Gorgeous Autumnal shadowbox, Marjie! The colors are stunning and your ink blending and stencil work is exceptional! Thank you for being our guest today and for all your hard work! I'm off to check out the guide on your blog! Many thanks, Sara. Happy to be with you! Marjie, great colors and layering. lots of inspiration. thanks as always for sharing. Oh Marjie, I absolutely love your shadow box! 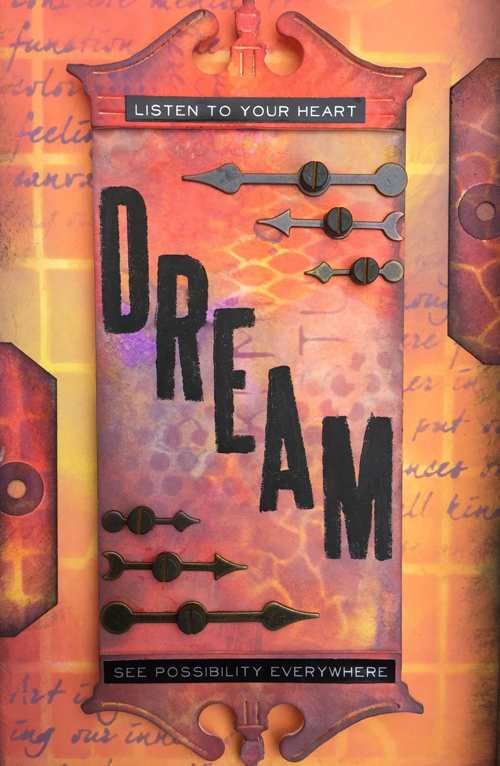 Stunning colours, and the stencilling and stamped elements add so much depth! What greatt use of those tags, - the whole cration just sings Autumn/Fall to me and is just really beautiful! Thanks so much for guesting with us again!!! Thanks, Astrid. As if on cue, the weather here has changed and Fall truly is in the air! 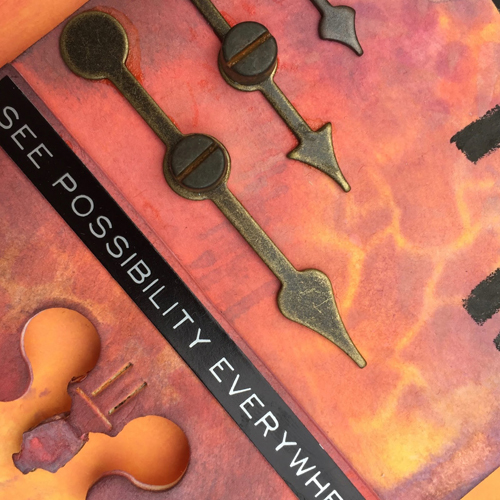 Such an incredible project Marjie! I love how you used so many similarly created panels in a variety of ways to make a beautifully coordinated project! Thanks, Tracy! Aren't those Oxides rich? Perfection!! Wonderful colors and project - always enjoy seeing what you make. Thanks for joining us. WoW! This is absolutely stunning! Marjie. Your creative design and execution are superb and you have , as always, achieved so much depth and detail with your amazing use of colour, stamping and stencilling . Thank you so much for sharing your talent with us . Thanks so much, Amanda! I appreciate your kind words. They look amazing, how I would love to create like this! It's loads of fun working with these inks, Pinky. Give it a go! Thanks for having me, Julia! Our Fall sure has caught up now... Brrrrr! I don't know how I missed this at the time, but what a fabulous project from Marjie! 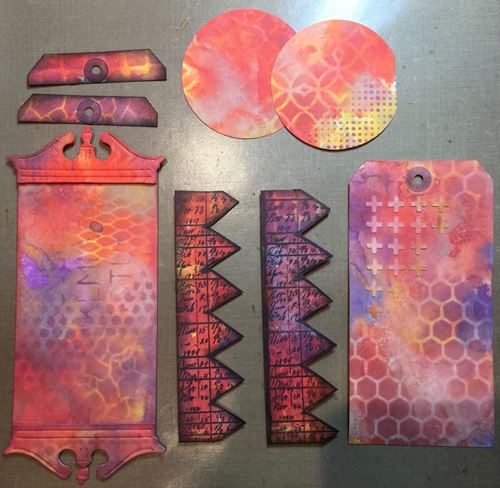 The colours are just stunning in their vivid intensity, and I love the layering effects of the stencils - magical Oxide work. Lovely to have you on the Vintage Journey with us, Marjie. Thanks for having me, Alison. A pleasure to be with you!